A highly evolved, extremely compact, and wonderfully versatile 5-speed that has stood the test of time, TREMEC’s T-5 first hit the scene in the early 1980’s as a product of the Borg-Warner company. From AMC Eagles to 5-liter Mustangs, in its rich 30-year history the T-5 has seen a variety of uses and numerous upgrades. Today the T-5 still enjoys life as an Original Equipment unit in overseas markets, while continuing to gain popularity in hot rod and performance markets everywhere. Dollar-for-dollar, pound-for-pound the T-5 is the smoothest-shifting, easiest to drive, and most reliable manual transmission for moderate horsepower applications available anywhere. 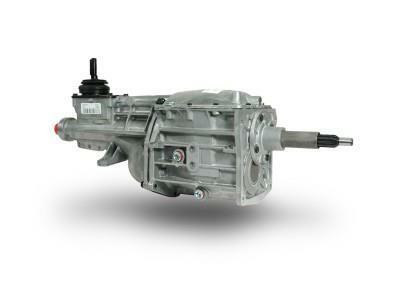 Easily accepting up to 300 lb-ft. of torque, the TREMEC T-5 is not only durable, but offers easy operation and a deep overdrive; making any hot rod, street rod, or kit car more enjoyable to drive.